The International Geology Review investigated an earthquake that was said to have occurred the same date as Jesus' crucifixion; which was most likely Friday April 3, 33 A.D. The research confirmed that two major earthquakes have hit the area specified, one during the period between 26 BCE and 36 CE, and could be the one referred to in the Gospel of Matthew. However, the earthquake data alone doesn't fully confirm the date. Williams, Schwab, and Brauer admit that the earthquake implied in the gospel could be allegorical, referring to the earthquake that occurred sometime before or after the crucifixion. She lit a new cigarette from the dying embers of the old one. “There might be ice, though,” she added hopefully. Aside from being a clever satire of the “it’s a wonderful universe” school of science writing, it also raises a good question about what we expect from nature. Does everything we learn about the universe have to make us feel good about ourselves? In many ways, the history of science is the history of humans getting progressively more freaked out by their own cosmic insignificance. Most cultures' origin stories tend to be about a plucky band of survivors overcoming the odds and becoming the chosen people — or, at least, the people who really matter. Understandings of humanity’s place in nature tended to follow the same pattern: whether we’re being made out of corn by the gods of the Popul Vuh so we can “keep the days” or being given command over all the other animals by Yahweh, we like to see ourselves as being kind of a big deal in the grand scheme of things. Giordano Bruno, a renegade sixteenth-century monk from the Kingdom of Naples, stands out as a true eccentric in this regard. Even today, his ideas sound slightly crazy: just last spring, in fact, I befuddled a lunch table of distinguished scholars at the Huntington Library by inadvisedly bringing up Bruno’s “alien Jesus” theory. there is a single general space, a single vast immensity which we may freely call Void; in it are innumerable globes like this one on which we live and grow. This space we declare to be infinite… In it are an infinity of worlds of the same kind as our own. 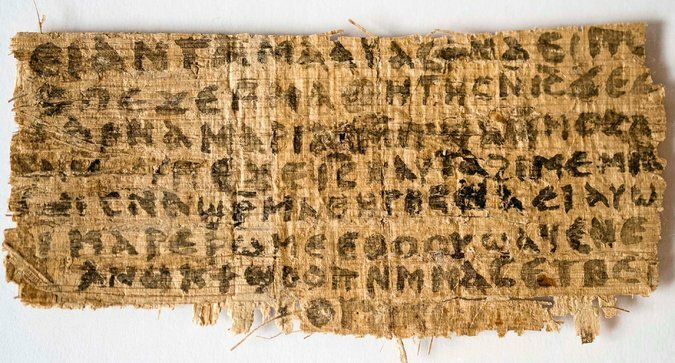 A fragment of papyrus, known as the “Gospel of Jesus’s Wife,” has been analyzed by professors at Columbia University, Harvard University and the Massachusetts Institute of Technology, who reported that it resembled other ancient papyri. British archaeologists from the University of Reading claim to have found a cave in Nazareth where Jesus christ supposedly lived. According to the magazine “Biblical Archaeology Review” the discovered site that is believed to be the place where Jesus was raised, was actually found in 1880 under a church but was only explored in 2006, and dates from the first century. Even though scientific evidence is something that lacks almost completely, it is believed that rulers of the Byzantine Empire ordered the building of the church to protect the site where, presumably, Mary and Joseph raised their son, who afterwards became, according to the Bible, the spiritual leader of Christianity. Researchers have found a text on the site which reads: “VII De Sanctis Locus” which is a pilgrim text identified from the year 670 AD which provides more likelihood of this assumption to be accurate. According to Ken Dark, director of the project, the excavation revealed a “home court” that was carved into the natural rock and complemented with stone walls that were built. Many of the original features remain intact inside the residence, including doors and windows. At the archaeological site, researchers have discovered tombs and a cistern. The researcher teams maintains distance from the presumption that this is in fact the house of Jesus Christ. According to Ken Dar, “given the current archaeological grounds it is impossible to say if this is in fact the place that Jesus Christ once called home, but there is also no archaeological evidence which would point to the contrary, so given the current details it is a possibility that should not be dismissed,” he concludes. A small village in the Polynesian kingdom of Tonga was graced with a divine vision. 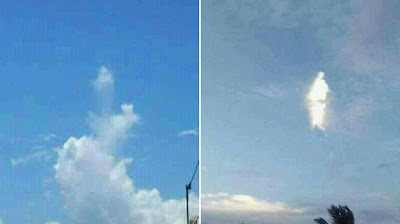 A cloud, which was similar to the image of the Virgin Mary or Jesus, hovered over the village of Halaleva. A local resident, Joey Mataele, snapped the photograph of a golden figure in the sky. We all thought it was an image of Jesus. While some people attribute this event to a divine message from heaven, skeptics state its simple pareidolia; the brain tricking the eyes into seeing familiar objects in patterns or textures. Pareidolia is pretty common. People see images of Jesus in pancakes and toast a lot. Even the so called “man on the moon” is an effect of this common visual matrixing. The fact of the matter is that it is the sign of a healthy brain when pareidolia occurs. The ventral fusiform cortex, the part of the brain where this processing occurs, is pretty efficient, and designed to establish patterns almost immediately. The average time it takes for a person to establish a pattern, especially a facial pattern, is between 130 and 160 milliseconds. This is a good thing from an evolutionary standpoint. In a fight or flight situation, a person does not really have a lot of time to sort out a friend from a guy who is going to put a stone axe into your skull. In the case of seeing Jesus or the Virgin Mary in the clouds, it really depends the the viewer. If that pattern is established by experience, imprinted in a person’s brain by their culture, then their brain will naturally use it as a data source to form the image. That means that if someone has never seen an image of Jesus before, the cloud would be perceived totally differently. Image of the Messiah or not, it’s better to err on the side of caution… so Hallelujah! Praise be! A photograph has surfaced appearing to show a divine figure in the sky above the Pacific island nation of Tonga. The image was taken by local resident, Joey Mataele, on New Year’s Day above his brother’s house in the village of Halaleva in Tongatapu. With a clear outline of a head, body and feet, and a golden glow from the sun, Mr Mataele believed it was a sign from the heavens. “This is an image that was unexpected and I know it's a miracle in my life. Thank you Lord for everything you've provided for me and my family,” he captioned the photo.